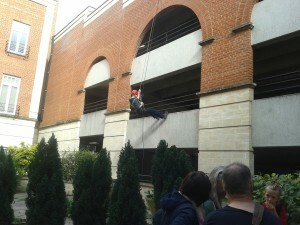 Saturday 20th September, 11:00, two brave community fundraisers took to the roof of Ecotricity’s Lion House (multi-storey car park) ready to begin their decent. Tom and Rich took the abseil in their stride making it down safely, navigating the jumps, holes and rails on their way. With a combined sponsorship total of over £200 we are very grateful to them both for taking on the challenge and raising funds for The Door. Also on the rooftop were volunteers from The Nelson Trust, Crossroads Care, Age UK and the MS Society, all taking part and raising funds for their chosen cause. If you have been inspired by this and would like to take part in future fundraising events, please get in touch with the fundraising team: thedoor.org.uk/contact or give us a call 01453 756745.